Add flavour to your favourite recipes and meals with Spice Market® All Natural Herb and Spice Shakers. With no artificial colours or flavours, no preservatives and no MSG, Spice Market® All Natural Herb and Spice Shakers are available in 15 popular varieties. Each shaker comes with a convenient shake dispenser and sealed with a snap lock lid, keeping your spice and herb range fresher for longer. Range Includes: All your favourites’ incl. Ground Paprika, Garlic Powder, Parsley Flakes and many more. 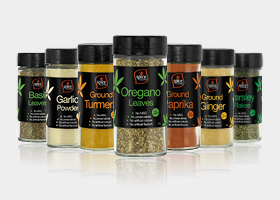 ground spices to all your favourite food and recipes and watch your meals come to life. are available in 3 varieties. 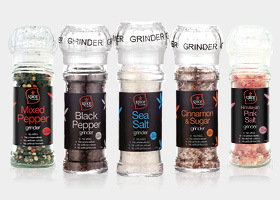 Range Includes: Black Pepper 45g, Sea Salt 110g, Cinnamon & Sugar 76g, Pink Himalayan Salt 110g and Mixed Pepper 45g.